For the third consecutive year, Salama Fikira will be sponsoring the Kenya Derby on Sunday 12th April 2015 at the Ngong Racecourse in Nairobi, Kenya. The Kenya Derby is the biggest event of its kind in East Africa’s horseracing circuit. This year will mark the 110th anniversary of horse racing in Kenya. “Salama Fikira is delighted to sponsor the Kenya Derby and looks forward to an exhilarating day celebrating 110 years of horse racing in Kenya. The sport has earned a lot of respect and reached an important milestone.” said Salama Fikira CEO Conrad Thorpe OBE. 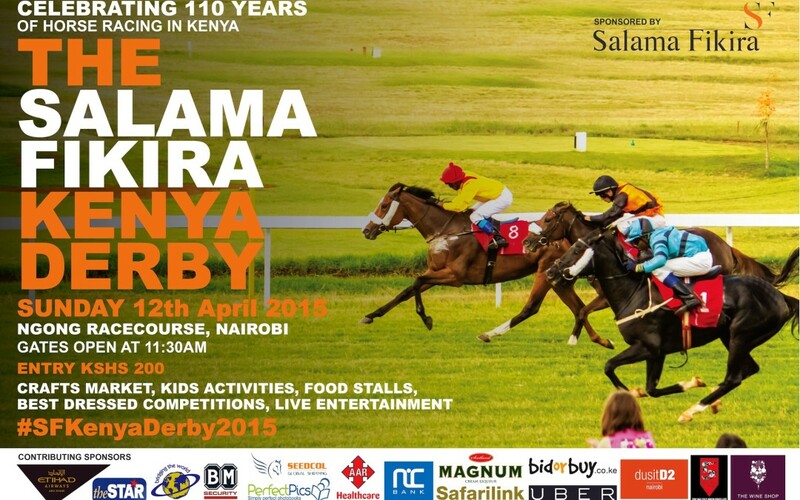 The Salama Fikira Kenya Derby is a show of world class horse racing with activities for both adults and children. Gates open at 11.30am. Sub sponsors joining us on the day include, The Star Newspaper, Etihad Airways, dusit D2, Bridging the World Travel, Seedcol Global Shipping & Bob Morgan Security. Signature cocktails and delicious food will be provided by Brew Bistro, who once again are supporting the event. Salama Fikira is an African Risk Management Consultancy headquartered in Nairobi, with regional offices throughout east, central and west Africa. The company supports multi-sector industries in the land and maritime dimensions, creating business assurance in complex and difficult environments for private, corporate and government entities.